Concept Store is the buzzword to tout a new notion of retail space. Many new stores are trying to claim the name of “concept store,” without really fulfilling the criteria. Today, the concept store is seen as a new kind of temple of consumption – light years away from the standard shopping center. The concept store is a multi-brand store, bringing together an eclectic and yet sophisticated selection of products of all kinds. Only restriction: the selection respects the general theme of space. Visitors can access products from around the globe. Other major features include a different way of thinking about sales and original digital innovations. No more outlets whose sole purpose is to sell! Now, the priority is to experience. The shop loses its commercial character to become a place of life. It offers ancillary activities that encourage the customer to stay, enjoy, and create an emotional bond with the store. With a more informal approach than that of the point of sale, the concept store organizes after-work parties, festive grand openings, product launches and/or workshops. The goal? Re-humanize the exchanges between sellers and consumers. The goal is for the customer to forget that they are in a retail store. 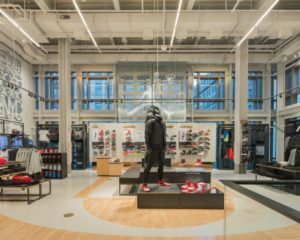 The concept store is the place where brands can give free rein to their architectural desires, and also serve as a pilot store while presenting new interactive solutions. This allows brands and vendors to collect important data for the overall digital deployment. Concept store installations have multiplied around the world, each exploring and displaying its identity to the fullest. 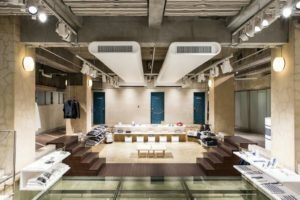 Opened at the end of 2016, this 5-level concept store is particularly interested in customizing models. There are workshops that focus on flocking, painting and even tag. On the top floor, there is also something to test the models, including an indoor basketball court. The brand of Brazilian rubber shoes Melissa Galeria makes the choice of audacity with a concept store playing on the opposition between digital and vegetal. She already sets the tone with the huge screen that dresses her shop windows. Those who push the door of the point of sale will be inevitably disoriented (and even taken aback). It is an association that can surprise and yet, that seems logical. Strong of their common values, the two signs decided to make a common concept store. Space has been thought of as a bubble of well-being and gluttony. It also relies on new sensory experiences – staging of manufacturing steps, games on visuals and smells. L’ Occitane is customary of impressive and innovative concept stores. 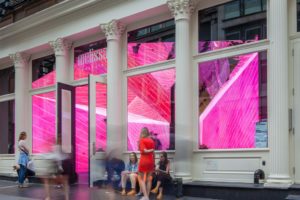 Recently, the brand has opened a boutique of 173 m2 in New York, paying homage to Provence with a large reinforcement of digital installations. Among the proposed activities, guests can simulate a bike ride in the Provençal landscapes or take part in a hot-air balloon ride in the South of France in virtual reality. This is part of the brand’s strategy: to offer a unique shopping experience tailored to the local clientele. She has also distinguished herself in Brazil, China, and Canada. This luxury brand, created by the French Laure Hériard Dubreuil, has created a privileged space by its most prestigious clients. 6 levels of mixing works of art, furniture and exclusive products. The concept store also blends eras to sometimes get closer to the art gallery. The top floor is entirely dedicated to personal shopping. Secret Location is one of those concept stores that blurs the line between artistic expression and intellectual expression. Inspiration is the keystone of the space where works of art rub shoulders with pieces of clothing, at the very limit of provocation. All the parts marketed respect this state of mind. 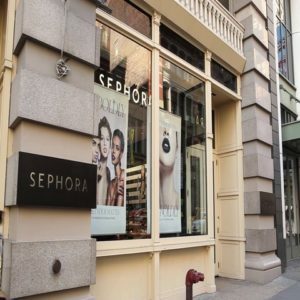 In its New York concept store, Sephora chooses innovation by offering its customers many tools: humiditère, ColorIQ, customization of bottles … They can also test a wide range of products through digital screens and share their impressions directly on social networks. Designed by Hiroshi Fujiawara, The Pool Aoyama is housed in the abandoned pool of a residential building. The point of sale embraces the nautical theme and is organized around the water point. It markets its own line of indoor products as well as other brands. The concept store is increasingly used as a communication tool by major brands. In this configuration, it is not necessarily about selling but about making people talk. This is also why these spaces benefit from sumptuous openings. Some even become tourist spots for professionals around the world. For others, the concept-store remains a way of expressing one’s creativity and touching one’s target as closely as possible. All have understood that to distinguish themselves, the customer experience was the key. > Do you want to increase your point of sale? Contact us, CrownTV is here for you.